Special retreat with Carme Torrent and Juan Carlos Escanciano. Workshops on movement exploration, on the Universe and the Stars. Daily circumstances are full of wonder if one encounters the serenity to observe them in silence. And being conscious that we a part of something bigger, maybe infinite is mind blowing. Life is movement. No matter how small or slow, this constant and continuous vibration is present in every cell that forms part of the Universe. So the Universe breathing is also present in our bodies. Looking deeply this movement, a beautiful dance in itself, arises the same awe that in a child watching the sky. The retreat starts on Wednesday, September 4th at 15:30h. There will be a welcome, a yoga class, an introduction and opening. The retreat finishes on Sunday, September 8th at 14:30h, after lunch. A whole movement practice (BodyWeather) which helps us develop mindfulness and cultivate a connection between body-mind-environment. It can also be understood as a dynamic meditation practice in which we develop our ability to listen in a holistic way. Listening with real sensivity and opening all of our senses and the pores of our skin, paying attention to ourselves, those around us and the environment. -To re-examine our movement patterns To listen to the world around us with our skin. -To re-learn how we generate our movements and what those movements generate in turn. -And finally to understand the body as a holistic entity made up of many different yet interdependent parts. During the retreat, we will carry out a series of improvisation exercises that will allow us to open our body and give it space and tranquility. We will also practice Katsugen Undo and Yuki, Japanese techniques of body movement that consists of paying attention to the spontaneous movement of our body. Yoga classes are for all levels of practice. The sesiones are based on principles of Kashmir Yoga. In this practice, the asanas are special moments in which we sense the tranquility that lies at the heart of all life. Time between the asana practice is dedicated to meditation allowing us space to familiarise ourselves with our body’s natural absorption and vibrational state that arises unexpectedly during these moments. We will explore the body just as it is in each moment – any areas where we feel emptiness, tension or reaction. Allowing deep listening to become the guiding principle, without expecting anything in return. During the meditative walks we connect with our internal nature, as well as with our external surroundings, allowing our perception of nature to flow through all our senses, including those we may not even be aware of. Perceptions and sensations flowing from inside to outside and visaversa. Our breath and its modifications, sensations and bodily reactions, the organic movement that the body creates and the perception of the environment through all of our senses are some of the elements that allow us to re-learn to walk, experiencing the integration of the body, mind and all life. Walking in silence we can find a natural state of calmness and harmony within ourselves and with everything around us. In this state our minds can experience a deep sense of rest. 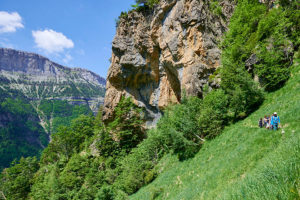 There will be 2 longer excursions in Ordesa and Monte Perdido National Park. Everyday there will be guided meditation sessions, in the morning and before going to sleep. The best way to start and finish the day. We practice simple techniques that are easy to carry on at home. We use universal elements to all of us as concentration objects, such as the breath, the body sensations, sounds, etc. The workshops about the stars, the universe and our place within it, aswell as observing the stars and the moon will be facilitated by Juan Carlos Escanciano. With his scientific knowledge and using modern technology the astronomical observations are presented in an easy and impressive way. Juan Carlos connects astronomy, anthropology and psychology in a poetic and deep way helping us to understand our origins and our current position in the Cosmos. In Sanskrit, Sat means truth and Sang means group or community. Satsang is a gathering to share our concerns, questions, and our deepest insights. It is also a time to meditate together, contemplate nature and sing meditative songs or mantras. Karma Yoga is Yoga in action = finding skillfulness and integration in any action. We bring the principles of Yoga in everything we do. We invite you to practice Karma Yoga by helping us with simple tasks of the house as fetching water from the fountain, chopping vegetables, drying dishes, etc. Carme studied and worked in architecture. In the Dance/ Movement field, an important part of her experience comes from the Body Weather Laboratory, a dance practice developed by the Japanese dancer Min Tanaka, with whom she studied directly in Japan for some years and has collaborated several times. She has also been developing a way of exploring and listening to the tactile capacity of the body through the regular practice of seitai (Katsugen-undo and yuki) and trainings in shiatsu and movement with Akinobu Kishi (Seiki). She was touched by the non-dual traditional teachings, and deepens her understanding with the help of Eric Baret in the practice yoga Kashmir Shaivism. Juan Carlos Escanciano is the creator of Navetierra, a project of propagating science, with emphasis on astronomy and space exploration, and its potential impact on the human mind and in society. Juan Carlos was initially formed as a Computer Engineer, a profession he has practiced for over 15 years and now has left. In fact, his early passion for the mountains, science and spiritual traditions encourage him to look for something more tuned with his true vocation. -Learn more about mindful eating and our vegetarian food. Everyday from the end of the evening Satsang up until before lunch the following morning, we cultivate joyful silence in the house. This deep silence is very healing for calming the mind and being in peace with ourselves, allowing us to deeply listen to ourselves. We will have a restful sleep and the next day we will enjoy the silence with mental clarity during our asana practice, meditation and other activities. Breakfast will be taken mindfully and in silence. By participating in this period of joyful silence we will be supporting each other in our practice. Throughout the afternoon we will enjoy conscious speaking and deep listening, which will allow us to get to know each other in a more authentic way. ✔️ 4 nights of accommodation (except the "without accommodation option"). ✔️ Daily yoga/ movement classes with Carme Torrent. ✔️ 2 special workshops on “Our place in the Universe” with Juan Carlos Escanciano. 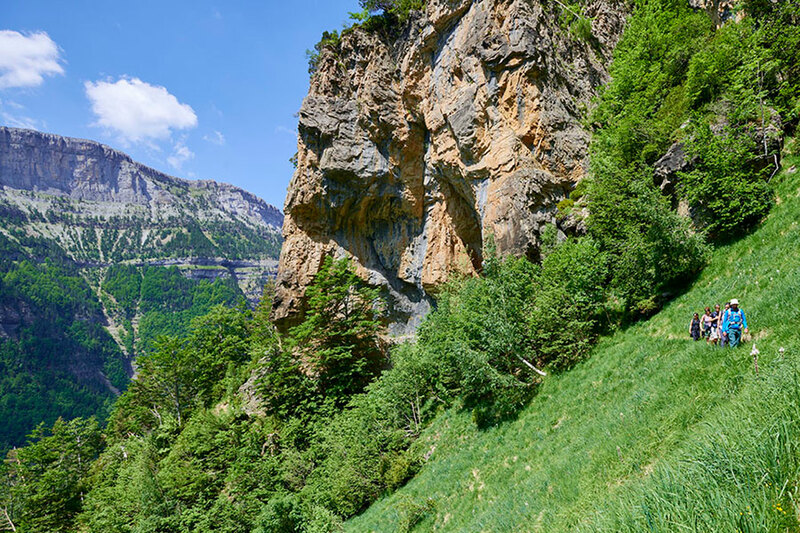 ✔️ 1 longer meditative hike of half day in Ordesa National Park. -10% if you have already come to one of our retreats. -10% on your 2nd retreat if attending two consecutive retreats. -7% if you come with a group of 4 or more people.